Look at these cute little pigs! Aren’t they adorable? I love the expressions they are wearing. The sculptures were hand-sculpted from polymer clay, fired, and glazed by Betty at lvsbeadsnthings. 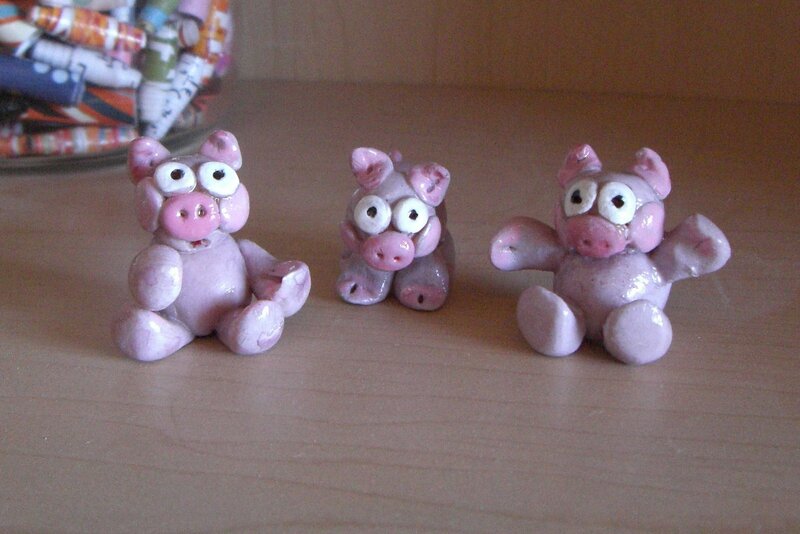 (You can see more of her clay critters on her blog.) Betty was kind enough to trade these (and some of her patented puppy poppers) for a pair of earrings and some gemstone pendants. Pigs are amazing animals: smart, funny, and expressive. I love to have little piggy things around the house to remind me of the pigs at the Farm Sanctuary. The Farm Sanctuary is my favorite place on earth, and the pigs are my favorite animals there. Having my own little pigs makes me happy…thanks Betty for contributing to my joy! 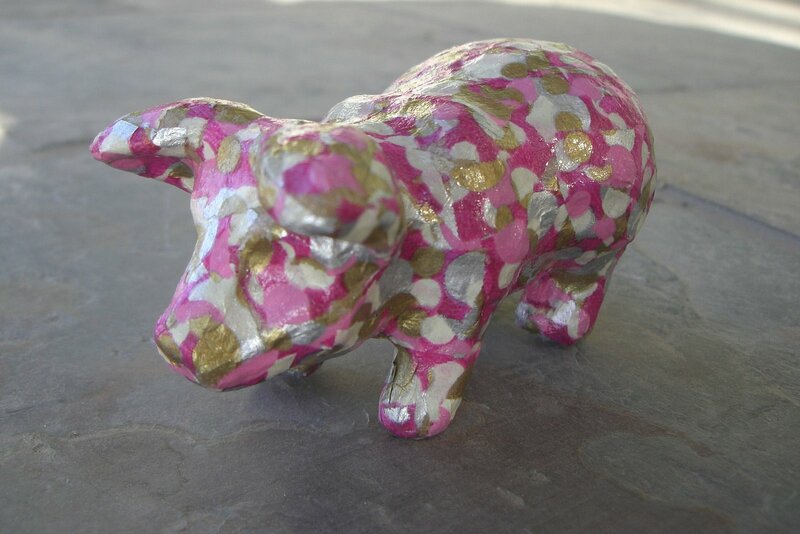 My pretty in pink pig was so cute and so fun to make that I got another paper mache pig! They must be quite popular because Ornamentea, the only online shop I know of that carries them, is almost always out of stock. For the second pig, I used pretty purple and teal Decopatch paper. They are having great fun together and are looking forward to cooler weather in Ithaca. If I remember this conversation correctly, Lizzie once told me that in the 70s, they decoupaged everything. I can see why because it is fun! 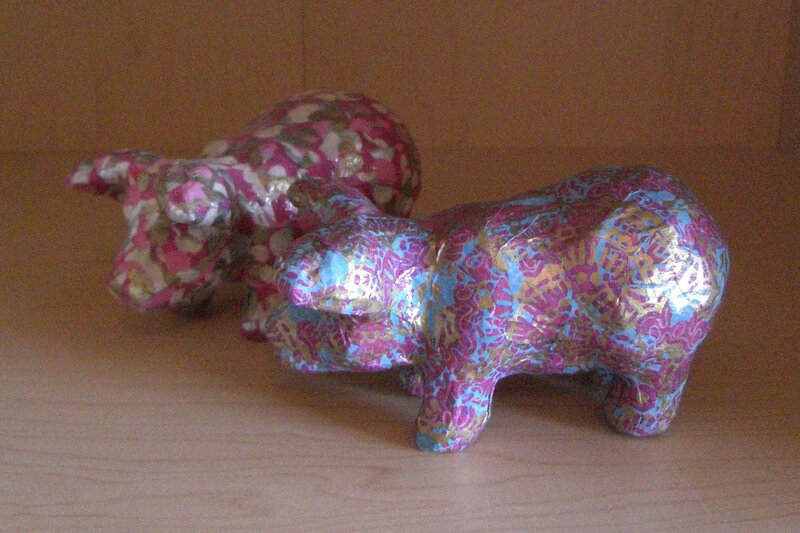 A trendy company called Decopatch is manufacturing special paper that makes it easy to, as they say, “paint with paper.” I particularly like their paper mache animal forms. Last night, I finished a cute pig! 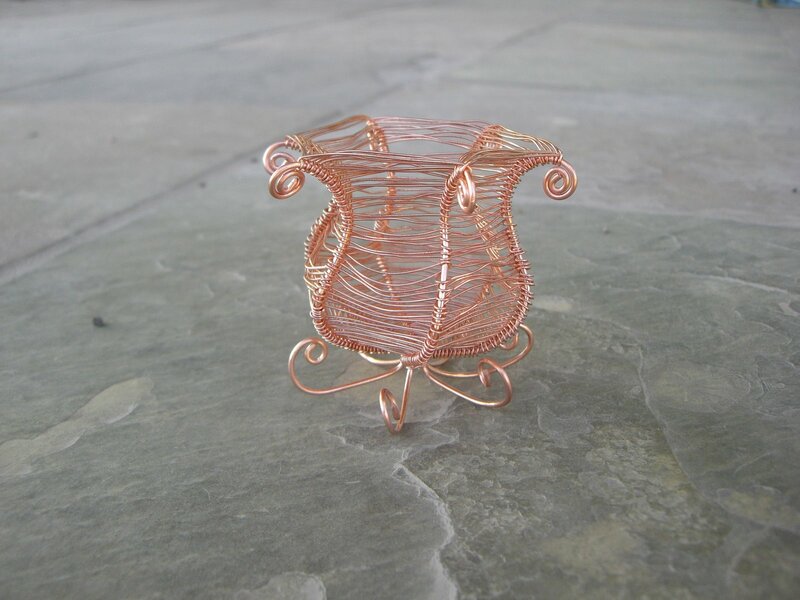 I learned how to make woven wire baskets at Metals Edge Studio. I’m pretty thrilled with how this one, my first, came out!